This is a challenging and demanding body transformation program that can get you stronger and leaner over the next 12 weeks. This program can be used to check and confirm you’re not just going through the motions. It asks you to progress in at least some way each week, as long as you are able to keep form intact. If you start this routine, execute it properly and finish it to its entirety, the end result will be worth it. If you want to take this program to the gym with you: Download the pdf here. Download the word document here. Being around a lot of commercial gym activity, I have detected many crucial behaviors that greatly delay or block the development of those who work out regularly. Omitting exercise technique, which is usually the most problematic of them all, three other complications are listed below. Most people don’t train nearly as hard as they think they do. A larger number of individuals implement the same program and apply the same methods over and over again. Even when they think they are “switching it up”. Some trainees experiment too much and don’t allow programs enough time to do what they are intended. Consequently so, the goals of this program are straightforward. To get you stronger and leaner over the next twelve weeks. To improve on and perform the big basic exercises through a variety of parameters. To execute something different than what you are used too, amplifying your calendar with exhilarating training methods. Here are some things you may notice, if you carry out this plan of action with full adherence and effort. You will be “forced” to improve and progress every week, apart from the active deload. You will be asked to change the resistance, use a different amount of rest time, or hold positions a bit longer etc. from the beginning to the end of this program. You will see benefits while on this training cycle, but may see even more while executing your next one, or when you go back to your “regular” style of training. First and foremost, you will be aggressive and work extremely hard for six weeks. After that, you will perform an active de-load on week seven, where you will spot things like a decrease in training volume, and an increase in the rest time. This will give your mind and body a “break” from the arduous work you just finished. Lastly, you will get back at it for five more weeks of vigorous exertion. All of the sets listed below are your working sets. The warm up sets you use to build up to your working weight do not count. I left out percentages in this program. For that reason, make sure you are adding resistance when it says to do so, and diligently following the set, rep, and rest time criteria for each week. Keep track and log how much weight etc. you use during each training session. Use a journal and stop watch, or even your phone if necessary. Don’t trust your memory with this program. Standardize the reps as much as you possibly can. By this I mean perform each session in such a way that the conditions are consistent each week. For example, don’t perform front squats through a full range of motion the first week, then with partial range of motion the second week, unless it’s directed. Don’t follow the rest time, reps, or sets I have prescribed one week, then ignore them the next. Stick to the framework and keep the exercise technique as consistent as possible. *Throughout this session perform full range of motion, strict chin-ups. If you cannot do them, get assistance from a band or a partner. Avoid pull-down and assisted pull up machines if possible. Sets: You can execute these wherever you choose. Just make certain you complete the number of reps instructed above by the end of this session. If you can perform 10 strict chin ups or more in a single set, add enough resistance to where 6-8 reps would be your max instead. 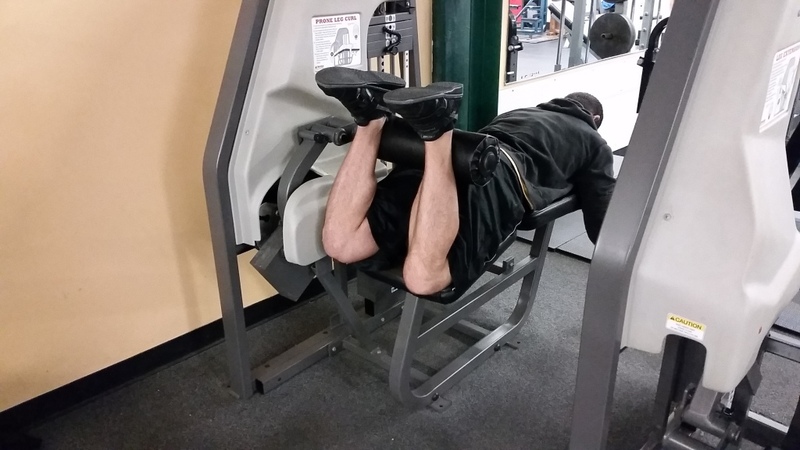 Then execute 5 bottom-half partial reps.
Next do 5 top-half partial reps.
To finish, perform an isometric hold for 5 seconds with the hamstrings at full contraction. Complete all sets of A before moving onto B. Week 1: 3×6 (120 seconds rest between sets) -Choose a weight you can perform all sets and reps with leaving 1-2 reps “in the tank”. Week 2: 4×6 (120 seconds rest between sets) -Use same weight as week 1. Week 3: 5×6 (120 seconds rest between sets) -Use same weight as weeks 1 and 2. Week 4: 3×3 (150 seconds rest between sets) -Perform with more weight than previous weeks. Week 5: 4×3 (150 seconds rest between sets) – Use same weight as week 4. Week 6: 5×3 (150 seconds rest between sets) – Use same weight as week 4 and 5. Week 7: 2×12 (180 seconds rest between sets) -Choose a weight you can perform all sets and reps with leaving at least 2 reps “in the tank”. Do not pause at the bottom this week. Week 8: 3×6 (120 seconds rest between sets) -Use more weight than week 1. Week 9: 4×6 (120 seconds rest between sets) -Use same weight as week 8. Week 10: 5×6 (120 seconds rest between sets) -Use same weight as weeks 8 and 9. Week 11: 2×3 (150 seconds rest between sets) -Perform with more weight than week 4. Week 12: 3×3 (150 seconds rest between sets) -Perform with same weight as week 11. Week 1: 3×10 (75 seconds rest between sets) -Choose a weight you can perform all sets and reps with leaving 1-2 reps “in the tank”. Week 2: 3×12 (75 seconds rest between sets) -Use same weight as week 1. Week 3: 3×15 (75 seconds rest between sets) -Use same weight as weeks 1 and 2. Week 4: 3×10 (75 seconds rest between sets) -Perform with more weight than previous weeks. Week 5: 3×12 (75 seconds rest between sets) -Use same weight as week 4. Week 6: 3×15 (75 seconds rest between sets) -Use same weight as week 4 and 5. Week 7: 2×12 (120 seconds rest between sets) -Choose a weight you can perform all sets and reps with leaving at least 2 reps “in the tank”. Week 8: 3×10 (75 seconds rest between sets) -Use more weight than week 1. Week 9: 3×12 (75 seconds rest between sets) -Use same weight as week 8. Week 10: 3×15 (75seconds rest between sets) -Use same weight as weeks 8 and 9. Week 11: 2×10 (75 seconds rest between sets) -Perform with more weight than week 4. Week 12: 3×10 (75 seconds rest between sets) -Perform with same weight as week 11. Week 1: 3×12-15 (60 seconds rest between sets) Establish a working weight. Week 2: 4×12-15 (60 seconds rest between sets) Use same weight as week 1. Week 3: 3×12-15 (45 seconds rest between sets) Use same weight as week 1. Week 4: 4×12-15 (45 seconds rest between sets) Use same weight as week 1. Week 5: 3×12-15 (30 seconds rest between sets) Use same weight as week 1. Week 6: 4×12-15 (30 seconds rest between sets) Use same weight as week 1. Week 7: 2×12 (90 seconds rest between sets) -Choose a weight you can perform all sets and reps with leaving at least 2 reps “in the tank”. Week 8: 3×12-15 (60 seconds rest between sets) -Use more weight than week 1. Week 9: 3×12-15 (60 seconds rest between sets) -Use same weight as week 8. Week 10: 3×12-15 (45 seconds rest between sets) -Use same weight as weeks 8 and 9. Week 11: 2×12-15 (45 seconds rest between sets) -Perform with more weight than week 4. Week 12: 3×12-15 (30 seconds rest between sets) -Perform with same weight as week 11. Perform the reps listed below with full range of motion. Add 10 more bottom-half partial reps to each set. Week 1: 3×15 (45 seconds rest between sets) Establish a working weight. Week 2: 3×20 (45 seconds rest between sets) Use same weight as week 1. Week 3: 3×25 (45 seconds rest between sets) Use same weight as week 1. Week 4: 3×10 (60 seconds rest between sets) Increase resistance above the previous weeks. Week 5: 3×12 (60 seconds rest between sets) Use same weight as week 5. Week 6: 3×15 (60 seconds rest between sets) Use same weight as week 6. Week 8: 3×20 (45 seconds rest between sets) Use more weight than week 1. Week 9: 3×25 (45 seconds rest between sets) Use same weight as week 8. Week 10: 3×30 (45 seconds rest between sets) Use same weight as week 8 and 9. Week 11: 3×10 (60 seconds rest between sets) Increase the resistance above what you used week 4. Week 12: 3×12 (60 seconds rest between sets) Use same weight as week 11. Week 7: 2×8: (180 seconds rest between sets) -Choose a weight you can perform all sets and reps with leaving at least 2 reps “in the tank”. Do not use a slow 4 second eccentric this week, instead lower down with a count of 1-2 seconds. Week 11: 3×3 (150 seconds rest between sets) -Perform with more weight than week 4. 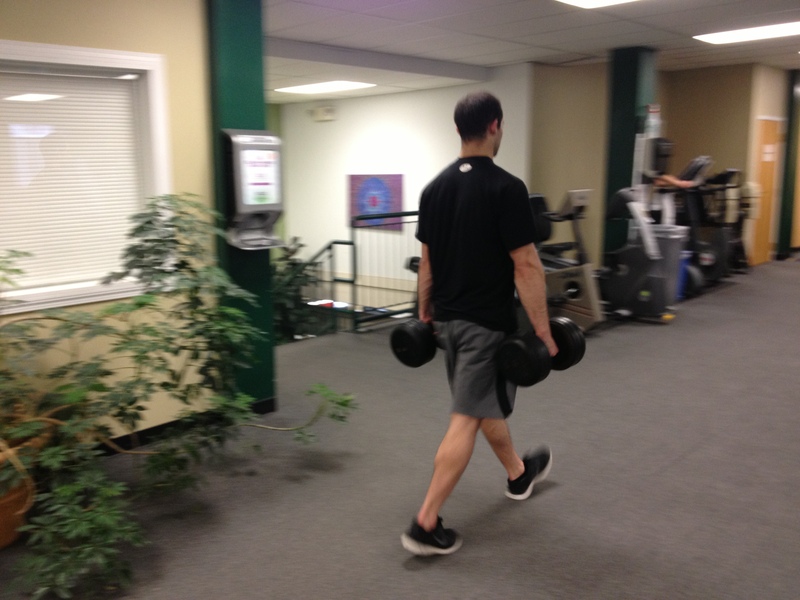 Week 12: 4×3 (150 seconds rest between sets) – Use same weight as week 11. Hold for 5 seconds at full contraction on the last rep of each set. Perform 1 set of C1) rest 30 seconds, then perform one set of C2) and rest 75 seconds. Repeat this until all of your sets are completed. Perform one front raise, then one side raise. Repeat this until you get to 50 reps total or 25 reps of each using minimal to no rest. Use controlled momentum as needed to finish the reps.
Week 1: 1×5 (180-210 seconds rest between sets) -Choose a weight you can perform all sets and reps with leaving 1-2 reps “in the tank”. Week 2: 1×6 (180-210 seconds rest between sets) -Use same weight as week 1. Week 3: 1×7 (180-210 seconds rest between sets) -Use same weight as weeks 1 and 2. Week 4: 1×5 (180-210 seconds rest between sets) -Perform with more weight than previous weeks. Week 5: 1×6 (180-210 seconds rest between sets) – Use same weight as week 4. Week 6: 1×7 (180-210 seconds rest between sets) – Use same weight as week 4 and 5. Week 7: 2×10 (210 seconds rest between sets) -Choose a weight you can perform all sets and reps with leaving at least 2 reps “in the tank”. If you have straps, use them this week. Week 8: 1×5 (180-210 seconds rest between sets) -Use more weight than week 1. Week 9: 1×6 (180-210 seconds rest between sets) -Use same weight as week 8. Week 10: 1×7 (180-210 seconds rest between sets) -Use same weight as weeks 8 and 9. Week 11: 1×5 (180-210 seconds rest between sets) -Perform with more weight than week 4. Week 12: 1×6 (180-210 seconds rest between sets) – Use same weight as week 11. Week 1: 3×6 per leg (90 seconds rest between sets) -Choose a weight you can perform all sets and reps with leaving 1-2 reps “in the tank”. Week 2: 3×8 per leg (90 seconds rest between sets) -Use same weight as week 1. Week 3: 3×10 per leg (90 seconds rest between sets) -Use same weight as weeks 1 and 2. Week 4: 3×6 per leg (90 seconds rest between sets) -Perform with more weight than previous weeks. Week 5: 3×8 per leg (90 seconds rest between sets) – Use same weight as week 4. Week 6: 3×10 per leg (90 seconds rest between sets) – Use same weight as week 4 and 5. Week 7: 2×6 per leg (120 seconds rest between sets) -Choose a weight you can perform all sets and reps with leaving at least 2 reps “in the tank”. Do not use a slow 4 second eccentric this week, instead lower down with a count of 1-2 seconds. Week 8: 3×6 per leg (90 seconds rest between sets) -Use more weight than week 1. Week 9: 3×8 per leg (90 seconds rest between sets) -Use same weight as week 8. Week 10: 3×10 per leg (90 seconds rest between sets) -Use same weight as weeks 8 and 9. Week 11: 3×6 per leg (90 seconds rest between sets) -Perform with more weight than week 4. Week 12: 3×8 per leg (90 seconds rest between sets) – Use same weight as week 11. Week 1: 3×10 (60 seconds rest between sets) -Choose a weight you can perform all sets and reps with leaving 1-2 reps “in the tank”. Week 2: 3×12 (60 seconds rest between sets) -Use same weight as week 1. Week 3: 3×15 (60 seconds rest between sets) -Use same weight as weeks 1 and 2. Week 4: 3×10 (60 seconds rest between sets) -Perform with more weight than previous weeks. Week 5: 3×12 (60 seconds rest between sets) – Use same weight as week 4. Week 6: 3×15 (60 seconds rest between sets) – Use same weight as week 4 and 5. Week 8: 3×10 (60 seconds rest between sets) -Use more weight than week 1. Week 9: 3×12 (60 seconds rest between sets) -Use same weight as week 8. Week 10: 3×15 (60 seconds rest between sets) -Use same weight as weeks 8 and 9. Week 11: 3×10 (60 seconds rest between sets) -Perform with more weight than week 4. Week 12: 3×12 (60 seconds rest between sets) – Use same weight as week 11. Rest between sets: None, go right into E2). Rest between sets: 45 seconds then back into E1). Perform one set of E1) then with minimal to no rest perform one set of E2). From here, rest 45 seconds and repeat until all sets are completed. Week 1: 3×8 (120 seconds rest between sets) -Choose a weight you can perform all sets and reps with leaving 1-2 reps “in the tank”. Week 2: 4×8 (120 seconds rest between sets) -Use same weight as week 1. Week 3: 5×8 (120 seconds rest between sets) -Use same weight as weeks 1 and 2. Week 4: 3×5 (150 seconds rest between sets) -Perform with more weight than previous weeks. Week 5: 4×5 (150 seconds rest between sets) – Use same weight as week 4. Week 6: 5×5 (150 seconds rest between sets) – Use same weight as week 4 and 5. Week 7: 2×12 (180 seconds rest between sets) -Choose a weight you can perform all sets and reps with leaving at least 2 reps “in the tank”. Week 8: 3×8 (120 seconds rest between sets) -Use more weight than week 1. Week 9: 4×8 (120 seconds rest between sets) -Use same weight as week 8. Week 10: 5×8 (120 seconds rest between sets) -Use same weight as weeks 8 and 9. Week 11: 3×5 (150 seconds rest between sets) -Perform with more weight than week 4..
Week 12: 4×5 (150 seconds rest between sets) – Use same weight as week 11. Week 1: 3×4 (120 seconds rest between sets) -Choose a weight you can perform all sets and reps with leaving 1-2 reps “in the tank”. Week 2: 3×5 (120 seconds rest between sets) -Use same weight as week 1. Week 3: 3×6 (120 seconds rest between sets) -Use same weight as weeks 1 and 2. Week 4: 3×4 (120 seconds rest between sets) -Perform with more weight than previous weeks. Week 5: 3×5 (120 seconds rest between sets) – Use same weight as week 4. Week 6: 3×6 (120 seconds rest between sets) – Use same weight as week 4 and 5. Week 7: 2×4 (150 seconds rest between sets) -Choose a weight you can perform all sets and reps with leaving at least 2 reps “in the tank”. Do not use a slow 4 second eccentric this week, instead lower down with a count of 1-2 seconds. Week 9: 3×5 (120 seconds rest between sets) -Use same weight as week 8. Week 10: 3×6 (120 seconds rest between sets) -Use same weight as weeks 8 and 9. Week 11: 3×4 (120 seconds rest between sets) -Perform with more weight than week 8. Week 12: 3×5 (120 seconds rest between sets) – Use same weight as week 11. Week 1: 3×6 (90 seconds rest between sets) -Choose a weight you can perform all sets and reps with leaving 1-2 reps “in the tank”. Week 2: 3×8 (90 seconds rest between sets) -Use same weight as week 1. Week 3: 3×10 (90 seconds rest between sets) -Use same weight as weeks 1 and 2. Week 4: 3×6 (90 seconds rest between sets) -Perform with more weight than previous weeks. Week 5: 3×8 (90 seconds rest between sets) – Use same weight as week 4. Week 6: 3×10 (90 seconds rest between sets) – Use same weight as week 4 and 5. Week 8: 3×6 (90 seconds rest between sets) -Use more weight than week 1. Week 9: 3×8 (90 seconds rest between sets) -Use same weight as week 8. Week 10: 3×10 (90 seconds rest between sets) -Use same weight as weeks 8 and 9. Week 12: 3×8 (90 seconds rest between sets) – Use same weight as week 11. Lower it down for a count of 3 seconds. 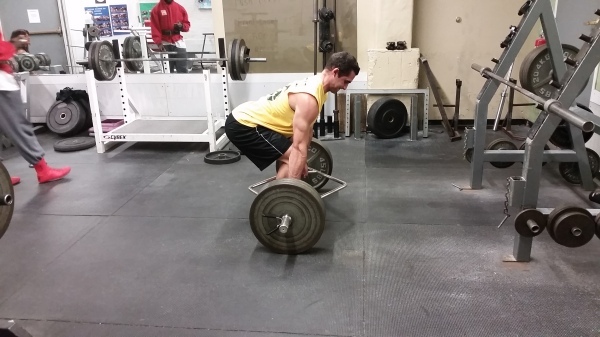 On the last rep you lower down, hold the barbell at midpoint for 5 seconds. On the eccentric portion of the exercise, lower down for a count of 3 seconds. On the last rep of each set, hold at full contraction (elbows straight) for 5 seconds. Go through exercises A1-A5, in order, with the prescribed number of reps above, and parameters below. Week 1: 1-2 rounds (90 seconds rest after each round) -Minimal to no rest between exercises. Week 2: 2-3 rounds (90 seconds rest after each round) -Minimal to no rest between exercises. Week 3: 3-4 rounds (90 seconds rest after each round) -Minimal to no rest between exercises. Week 4: 1-2 rounds (90 seconds rest after each round) -Minimal to no rest between exercises. Week 5: 2-3 rounds (90 seconds rest after each round) -Minimal to no rest between exercises. Week 6: 3-4 rounds (90 seconds rest after each round) -Minimal to no rest between exercises. Week 7: 1-2 rounds (120 seconds rest after each round) -30 seconds rest between exercises. Week 8: 1-2 rounds (90 seconds rest after each round) -Minimal to no rest between exercises. Week 9: 2-3 rounds (90 seconds rest after each round) -Minimal to no rest between exercises. Week 10: 3-4 rounds (90 seconds rest after each round) -Minimal to no rest between exercises. Week 11: 1-2 rounds (90 seconds rest after each round) -Minimal to no rest between exercises. Week 12: 2-3 rounds (90 seconds rest after each round) -Minimal to no rest between exercises. This program is for you if you have been “stuck” at the same fitness level for a while. It propels you into a stretch of land with less restrictions, as you get under weights, sets, and reps, you might have otherwise thought weren’t within your power or capacity. It’s really nice to execute something drastically different than you’re used to both physically and psychologically. If you train in a local or commercial health club, this program should fit your schedule nicely. Step out your comfort zone, give this a shot, and let me know how it goes. Feel free to take recognition and celebrate your new results a well. Again, if you want to take this program to the gym with you: Download the word document here. Download the pdf version here.